This 3M Doodlebug handheld pad kit offers an efficient, durable and versatile cleaning system. It comes with a Doodlebug pad holder, 5 brown strip pads, and 5 white scrub pads. The pad holder features hook style grippers that attach to any loop surface on a pad. The swivel style head offers 360° low profile cleaning with easy access to corners and under furniture. 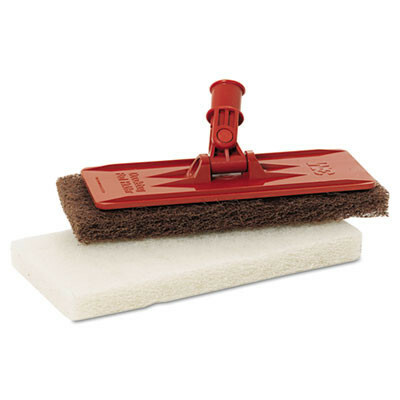 The pad holder twists onto any U.S. standard threaded broom handle (sold separately). This kit is designed for most cleaning tasks, from light-duty cleaning of delicate surfaces to heavy-duty cleaning of dirt and finish buildup. For other options, please feel free to look at our full line of hand pads. Customers who were interested in the 3M™ Doodlebug™ Intro Kit w/ Stripping & Scrubbing Pads were also interested in the following items. This is a review for the 3M™ Doodlebug™ Intro Kit w/ Stripping & Scrubbing Pads.